The Wong Sheung Kung Fu Club was founded in 1974 in Victoria, Canada by the late Sheung Wong. Edmond Wong has been the Sifu since the passing of his father. The club has a very rich history and up until Summer 2016, was located in Canada’s oldest Chinatown. The Hung Fut club is very traditional and the only place in Canada teaching this style of Kung Fu. 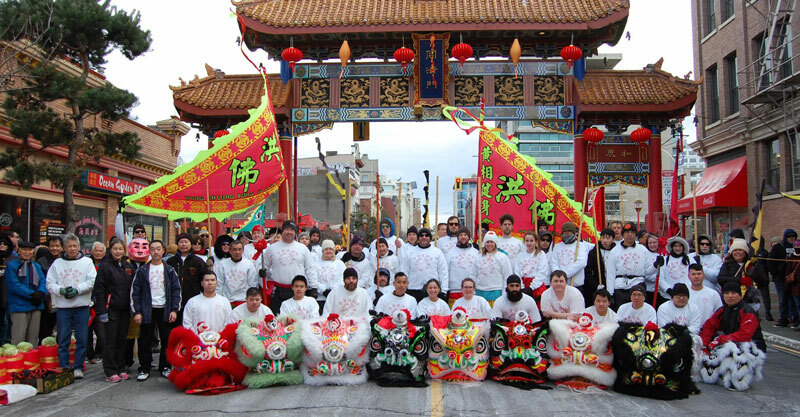 The non profit club is an active member in Canada’s oldest Chinese community. The Kung Fu club is non ranking and non competitive (no tournaments). Training involves ground work, stances and forms. The applications, weapons and lion dancing are taught after the basics are mastered. Born in Hong Kong, Edmond Wong is one of four children. At 10 years old he started training Hung Gar Kung Fu in Hong Kong. At 21 he emigrated to Canada and started training Hung Fut under his father Master Wong Sheung. Edmond Wong has been the Sifu since the passing of his father in 2001. Terry was born in Guangdong Province, China and immigrated to Canada when he was 11 years old. At age 14, he started training Kung Fu with the late Master Sheung Wong. Terry became Chief Instructor of the Wong Sheung Kung Fu Club in 2001. Terry is very active in the chinese community, and is prevalent in several different associations. Mark started visiting the Club often in 1980, but did not start training in earnest until 1988. Sigung Wong was a very influential person in Mark’s learning of Kung Fu. Since joining the club Mark has trained exclusively in Hung Fut. He has been one of the main instructors for the last 15 years. He received his black sash from Sifu Edmond Wong in 2007. Godwin began studying kung fu in Edmonton. Alberta under his father in the style of Wing Chun. He then focused his energies towards Hung Gar and fine-tuned his skills in long weapons. In 1999 Godwin moved to Victoria where he came across the Wong Sheung Kung Fu Club. The late Sigung Wong made such an impression that he joined the following week. With a background in long weapons and lion dance, Godwin received his black sash from Sifu Edmond Wong in 2007.